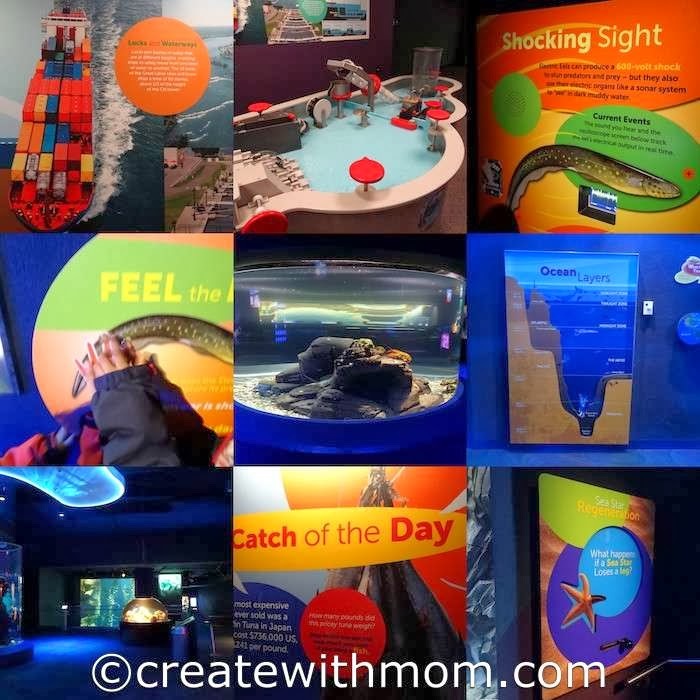 My family and I had an awesome time exploring all that is offered at the Ripley's Aquarium of Canada. 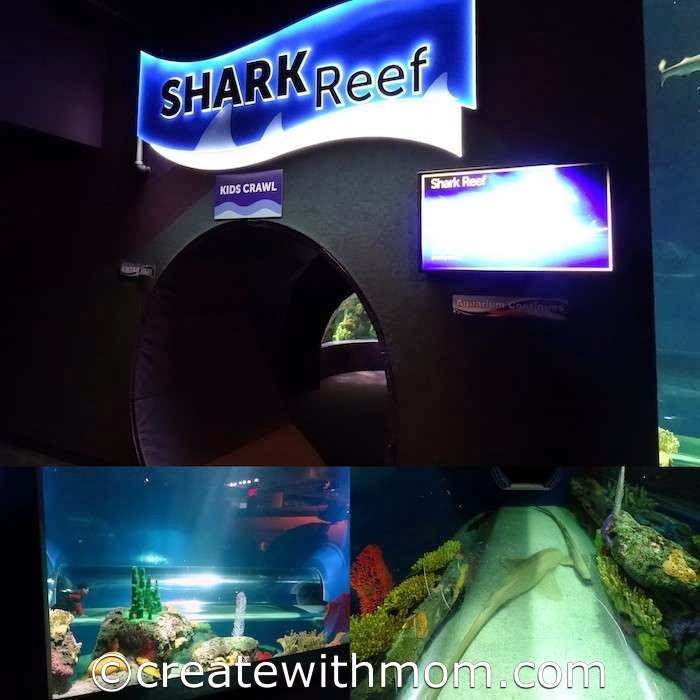 We were very excited to see the 135,000 square foot largest, indoor aquarium in Canada that has two levels with over 16000 animals found in the oceans and lakes from around the world. We were awed by the displays and the architecture that showed the natural beauty of marine and freshwater habitats. All the galleries are well displayed so we don't miss any of the attractions. We enjoyed hearing the background "under the water" sort of music during our visit while we were exploring. We had a few favourite attractions that we spent lots of time taking pictures and enjoying the beauty of the sea creatures. At the welcoming large lobby we can purchase tickets and check in our coats for a fee. Then we start off by exploring the sea creatures in the Canadian Waters. The 17 exhibits in the Canadian waters Gallery lets us discover the marine and freshwater wildlife that is found in the Atlantic, Pacific and in the Great Lakes Basin. The featured wild life include Alewife, Largemouth Bass, American Lobster, Wolf Eel, Giant Pacific Octopus, China Rockfish and more. The beautiful Pacific Kelp shows as though the fish are dancing. This display features a wave maker that simulates the surge conditions of the British Columbia shoreline. Rainbow Reef shows how colourful and beautiful life under the ocean can be. It made me feel like joining the fish and diving underwater. These inviting waters of the Indo-Pacific region will surely make us curious to learn more about the hundreds of colourful sea creatures. The featured sea creatures include Picasso Triggerfish, Humbug Dascyllus, Emperor Angelfish, Pajama Cardinalfish and Unicorn Surgeonfish. Then we were transported to the Dangerous Lagoon in a slow moving conveyor belt, which is in one side through the awesome underwater tunnel. We were excited to spot different types of sharks such as Sand Tiger, Sandbar and Reef Sharks. We also saw Roughtail Stingray, Moray eels, Saw fish, Barracudas, Green Sea Turtles and more. Before we entered the Discovery Centre, my children enjoyed going inside the kids crawl and posing for us to take pictures inside the tube with the sharks underneath. Children liked imagining they were Marine Biologists in the research submarine and had a wonderful time. We got a chance to touch Horseshoe crabs and learn about water systems. 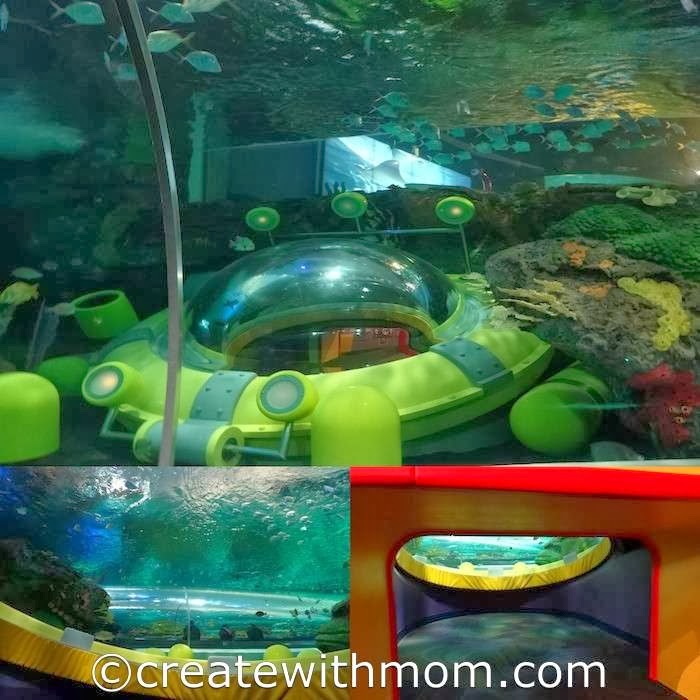 There are two pop-up habitats that children liked going under, which made them feel like they were closer to the fish. We saw Clownfish, Palette Surgeonfish, Guineafowl Puffer and more. There are washrooms by the Discovery Centre, which is convenient to wash our hands after touching and playing with everything before buying something to eat at the The Ripley's Cafe if you choose to. I liked this break at the Discovery Centre before the tour continued and led us to see The Gallery that displayed and gave lots of insight to predators and sharks. We saw living corals, Venomous fish, Electric eels, Seahorses, Red Lionfish, Piranhas and more. We enjoyed feeling the eel display, which gave us a better idea of an eel's electric power. We saw a variety of Stingrays and had a chance to see the amazing way they move at the Ray Bay. Spotted eagle rays, Southern Stingrays and Cownose rays are three of the species we will see here. Planet Jellies has seven different habitats that showcase beautiful colour-changing displays of a variety of jellyfish including moon jellies and upside-down jellies. Finally, we get to see how this amazing aquatic experience is engineered in the colourful Aquarium's Life Support System room. My children and we really enjoyed the interactive features throughout the aquarium and the special places that we can go in and feel as though we are underwater. They also have exhibits of interactive dive shows. The Ripley's Cargo Hold Gift Shop that is at the exit has a unique collection of marine themed gifts and keepsakes from around the world as well as from local artisans. Do visit the Ripley's Aquarium when it is not too crowded, as the large crowds can take away from the serene feeling of the aquarium and somewhat prevent us from enjoying the whole beauty and details of the hard work put into the making of it. This is a must see attraction and I am glad we got the opportunity to enjoy and learn about the amazing sea creatures god has created. I've been wanting to go to the aquarium but haven't yet b/c I have heard it is crazy busy and overcrowded. Thanks for the review...we will definitely visit soon! This is on my must see list. I see they have line ups already. It must be good. This is cool! Wish I could take my kids to visit! I liked your Exploring the Oceans at Ripley's Aquarium of Canada post. This looks like a great place to visit. Wow the pictures you took are just breath taking, I can not wait to bring my kids here we are planning for this year! This is on the list of things to do this year! Thanks for the visual motivation.